The Congo Civil War, or Congo Crisis, was a complex political tumult that began just days following Belgium’s granting of Congolese independence in 1960. Lasting four years, the associated violence claimed an estimated 100,000 lives including the nation’s first Prime Minister, Patrice Lumumba, and UN Secretary Dag Hammarskjöld, who was killed in a plane crash as he attempted to mediate the crisis. Escalating with the secession of the southernmost province of Katanga, the conflict concluded five years later with a united Congo emerging under the dictatorship of Joseph-Désiré Mobutu. 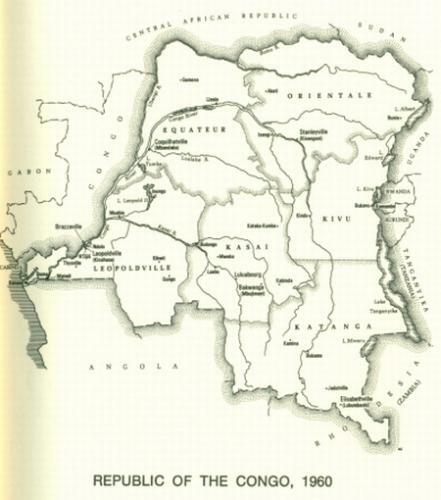 On June 30, 1960, Belgium negotiated post-colonial mining rights in declaring an independent Democratic Republic of the Congo (DRC). Yet within days, soldiers of the Congolese army mutinied, demanding increased pay and the removal of white officers from their ranks. When Belgium intervened militarily, more soldiers rebelled. Many of these soldiers gravitated toward the radical nationalist Prime Minister Patrice Emery Lumumba. Then, dominated by Belgian business interests, the mineral-rich Katanga province under the leadership of Moïse Kapenda Tshombe seceded from the DRC with Belgian support. Congolese President Joseph Kasavubu and Prime Minister Lumumba asked and received a peacekeeping force from the United Nations (UN). The conflict also became the site of a dangerous Cold War “proxy” contest between western powers led by the United States and the Soviet Union-led Communist bloc. Under pressure from western nations and in exchange for UN support, President Kasavubu purged his government of radical elements including Prime Minister Lumumba. The ultra-nationalist Lumumba, though supported by the Congolese, was viewed by Western business leaders as an obstacle to their continued investments in Congolese diamond mines. Fearing Lumumba was secretly a Communist, the United States was particularly adamant about his removal from power. Lumumba responded by firing Kasavubu as both leaders claimed control over the country, and Army Chief of Staff Joseph Mobutu in turn orchestrated a military coup d’état which ousted the two leaders. Mobutu’s government was supported by western governments. The Soviet Union and other Communist nations supported Lumumba who ultimately was killed by Katangan rebels. With his chief rival removed, Mobutu pledged nominal support to President Kasavubu and the two led the successful effort to end the Katanga secession. UN forces eventually recaptured all of Katanga province. In 1964, a new rebellion began in the Eastern Congo when armed fighters (“Simbas”) began to spread across the region. Ironically, Moïse Tshombe, who had led the secessionist Katanga province, was made prime minister with the mandate to defeat these rebels and end other regional revolts. The Simbas were defeated in November 1964. One year later, Mobutu seized power from President Kasavubu after having persuaded Western leaders that he was the most effective leader in the fight against communism. Kasavubu and Tshombe were exiled as Mobutu set up a one-party dictatorship, controlling the nation until 1997. Nonetheless, for the first time since independence, all of the country was ruled by one government. Kevin Shillington, Encyclopedia of African History (New York: Fitzroy Dearborn, 2004); Guy Arnold, Historical Dictionary of Civil Wars in Africa (Lanham, MD: Scarecrow Press, 1989); H. M. Epstein, ed. Revolt in the Congo, 1960-1964 (New York: Facts on File, 1965); G. Abi-Saab, The United Nations Operations in the Congo, 1960-1964 (London: Oxford University Press, 1978).